The condensing unit heater is a eco-friendly and efficient solution that is regarded as the best warm air heater on the market. This solution is comprised of a stainless steel gas condensing heat exchanger, and a premix burner . It ensures the highest efficiency from 98% to 106% and utilizes the latest technologies available, resulting in reduced running costs, noise and emissions.The unit is so efficient that quoted savings in gas consumption of up to 30% can be achieved when compared to a conventional gas fired unit heater, so if you want the most modern and most technologically advanced condensing unit heater, then range this is for you! Condensing warm air unit heaters can be operated on natural gas or liquefied propane gas (LPG) and have been on the market for quite a few years now, so the technology can be considered to be well proven. They achieve higher efficiencies by the utilization of a secondary internal heat exchanger, which turns the residual heat in the flue gases, which would be lost in a conventional non condensing unit heater, into useful heat energy. Therefor the rate of heat transfer into the warm air is increased without any additional fuel consumption. Our room sealed gas fired suspended warm air condensing unit heater range are autonomous heating units,with high certified quality. All heaters are subjected to a rigorous test during operation, following procedures indicated in the quality manual. 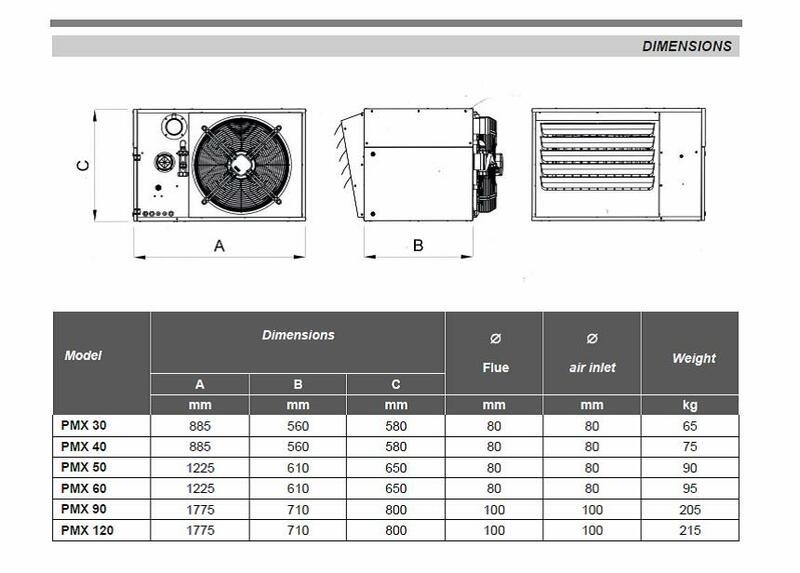 The entire series range of condensing unit heater are CE certified. 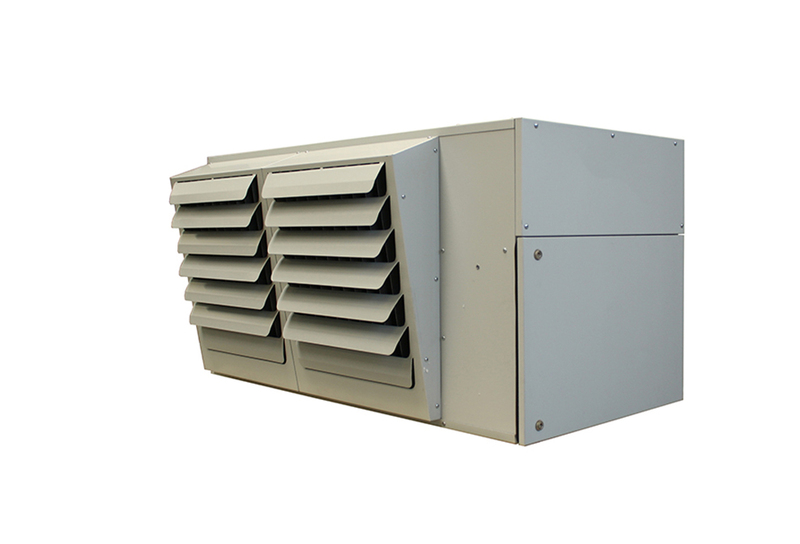 These units come with a fully modulating burner and have a high degree of efficiency. The heat is available immediately ( within 60 seconds) after starting the heater with no lead time as opposed to a wet heating system. The core of the units is the patented stainless steel heat exchanger for a high air flow, which has a warranty of 5 years. The heating capacity of the premix burner is of the modulating type and with a wide regulation range, from 100 % to 30 % of the nominal heat capacity. Thanks to the continuous modulation of the flame, as the heat demand from the environment decreases, it reaches efficiency values up to 106 %, consuming less gas. A perfect mixing of the fuel gas with the combustion air combined with a semi-radiant flame, contributes to obtain a hygienic combustion with very low emissions of carbon monoxide (CO) and nitrogen oxides (NOx),Class 5. Combustion chamber in stainless steel AISI 430 with low heat load, of suitable shape and volume. corrosion in the presence of condensation, with a large surface and a trapezoidal section with turbulating imprints that allow an excellent thermal efficiency. Front collector made of AISI 304 stainless steel fitoted with a circular joint for connection with the extractor and the condensate drain. It is equipped with a large door for inspection. The premix burner is of the modulating type and with a wide regulation range (from 100% to 30%). The gas valve delivers the fuel in relation with the combustion air flow rate according to a default factory setting.Axial fans with low noise and high air flow rate driven by electric motors complete with safety protection grilles. They meet the requirements of ErP directive .These condensing unit heaters benefit from a multi-function electronic board which features the burner ignition,flame supervision and total security functions. Mounting the units is very simple; they are designed for wall-mounting or to be suspended from the ceiling. The flueing options include a co-axial or sometimes referred to as a balanced flue set up , which can terminate either vertically through the roof or horizontally through the wall. 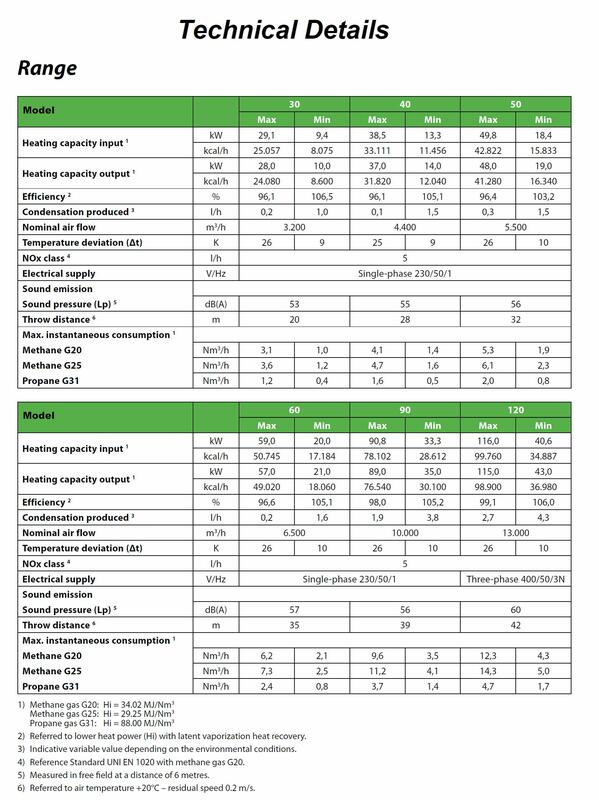 With any condensing unit heater there is a reduction in flue-gas temperature to below dew point, subsequently liquid condensate is produced . Just like condensing boilers ,this condensate is collected within the condensing unit heater and should flow to a drain point for safe removal. At present this regulation requires a minimum 91% nett efficiency with regards to warm air space heaters, which can be achieved by non-condensing unit heaters currently.However Energy Technology List criteria mean that to qualify for Enhanced Capital Allowances (ECAs), warm air space heaters will need to operate in condensing mode with minimum full and part load efficiencies of 101% nett. It currently looks like that ecological and legislative pressure will make condensing technology for warm air heaters mandatory in the UK in a very short time period, and future reversions of the Building Regulations Part L2 , will probably cover this requirement.